experience stress on a daily basis. We encounter situations that cause anxiety on a regular basis such as; a first date, new job, and even a argument with a friend or family. While we experience stress on a regular basis, it is important for us to have appropriate methods to help deal with stress. One of the fastest ways to reduce stress and anxiety is through deep breathing. Deep breathing is also a technique that can be completed in a short amount of time and just about anywhere. Make sure your shoulders are relaxed. In this breathing exercise, your stomach should expand, but your chest should rise very little. When we breathe through the chest it does little in helping us relax. Start by breathing in slowly and deeply through your nose. You can place a hand on your stomach and the other on your chest, so you can feel how you are breathing. Remember to breathe from your stomach. Exhale slowly and fully through your mouth. As you blow air out, keep your tongue and jaw relaxed. You may hear a soft “whooshing” sound as you exhale. Listen for this sound every time you practice and learn to value it as the sound of relaxation. Imagine that you are breathing in calm nourishing air and breathing out any stress, or negative feelings that you may have. Continue this breathing exercise for a few minutes, or until you fell relaxed. Remember to make your outgoing breath as long and smooth as you can. Counting to 10 as you exhale is a good way to stretch your exhale. Your exhale is the key to relaxation so give it your full attention and practice breathing out in a long slow controlled breaths. You will quickly feel the benefits of breathing away stress. Do you have another great way to help relieve stress and anxiety quickly? 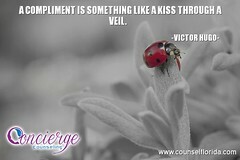 For more information about Stress & Anxiety visit Concierge & VIP Counseling. Please find us on Facebook or Twitter for relevant material and motivation @PSYCHConcierge. You can also access our entire gallery of FREE picture Quotes on FLICKR by clicking here please link back to our website counselflorida.com.